Minimally Invasive Techniques – Technological advancements like the da Vinci Si and Xxi surgical systems are taking minimally invasive procedures to the next level, dramatically reducing hospitalization and recovery times. Around-the-Clock Availability – No other surgical center in our region gives you the assurance of trauma, general and pediatric surgeons on duty 24/7. Unmatched Facilities – Our system includes more than 40 state-of-the-art surgical suites in four locations, including the region’s only custom-designed pediatric operating rooms at Children’s Hospital, as well as the region's only dedicated orthopaedic and opthalmic ORs. 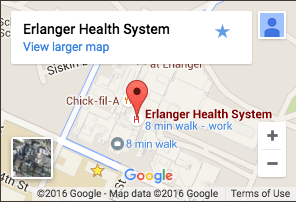 Academic Focus – As a campus of the University of Tennessee College of Medicine, Erlanger is among the elite 6% of all medical centers proven to provide higher standards and better outcomes.